Fixed geometry hydrodynamics journal bearings provide a reliable, reasonably economical way to support a rotating shaft. These bearings are used for many medium to large industrial machinery. They combine good load capacity with adequate stiffness and damping for many machines. The simplest such bearing is a circular bore bearing with a clearance between the bearing ID and shaft OD. One or more holes and/or feed grooves are added to supply oil into the clearance space. While quite widely used, this very simple bearing has some drawbacks. One of the most significant is oil-whirl instability. This instability can result in large, damaging vibrations once the shaft speed exceeds a threshold that is generally about 2x the first critical speed. To combat this instability, a variety of alternatives to a purely circular bore are used. These include lemon bore (elliptical), pressure dam, multi-lobe, and offset half bearings. In some cases, the added complexity and cost of a tilting pad journal bearing is required. Some of these bearings also can run cooler than the plain cylindrical bearing due to increased clearances and more oil-flow. However, all of these geometries are based on circular arcs. This was required when the bearings were manufactured on lathes and milling machines. With the advent of computer controlled machine tools and manufacturing methods such as wire-EDM, non-circular profiles can readily be manufactured. 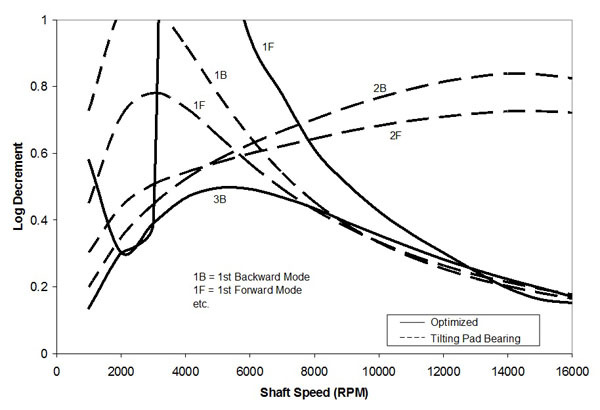 This leads to the question of whether the bearing profile can be optimized to improve stability (or some other parameter such as stiffness or power loss). To help address this question, Dr. Swanson developed an iso-thermal finite element bearing analysis code that was optimized for speed. This code was based on quadratic, iso-parametric elements to reduce the number of elements required for a given accuracy level. 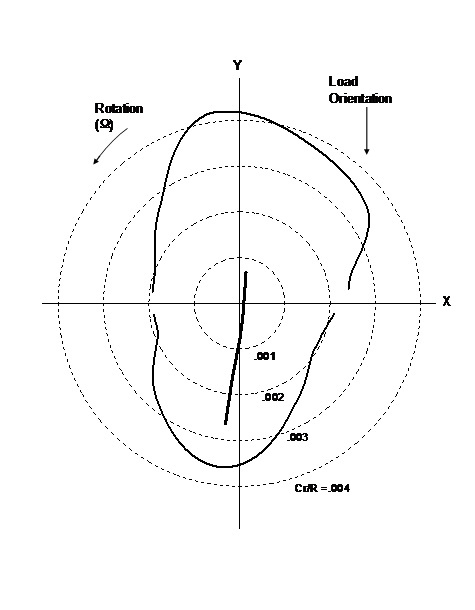 An iterative cavitation algorithm that locates the cavitated region(s) and enforces a zero-pressure gradient boundary condition was also included. Using this code, profile optimization using a variety of optimization techniques was performed. Ultimately, it was concluded that it is possible to significantly enhance the stability of a fixed geometry bearing. A paper summarizing much of this work was published in Tribology Transactions in 2005. This work has been on hold since this paper was published. The main issues were the need for an improved mass-conserving cavitation algorithm, and a better way to address manufacturing variability in the analysis without significantly increasing the computation burden. It also became clear that the bearing should be optimized for a specific rotor to maximize the benefits. The optimization also needs to consider the unbalance response amplitudes and amplification factors, as well as starting friction/loads. Some care is required to have a bearing that can actually be manufactured and works well over the machines entire speed range. Swanson, E.E., Fixed-Geometry, Hydrodynamic Bearing with Enhanced Stability Characteristics. Tribology Transactions, 48, 2005, pp. 82-92.